We all know how important it is to drink LOTS of water each day. As a former sweet tea addict, I'm the first to say I know it isn't easy. But over the years, I've changed my habits so drastically that I almost can't even stomach a glass of really sweet tea anymore. My go-to is water, or flavored water. It's best to try to consume half of your body weight in ounces of water each day. So, if you weigh 120 pounds (who is that skinny?! Not me. BLESS YOU. Come teach me your ways! ), you'd drink 60 ounces of water each day. That can get really old, really fast. I LOVE water now, and honestly I drink more than half my body weight daily, but even I like to spice it up a little with some flavor. Enter…my favorite water drinking hack! ICE CUBES. Ice cubes are a rather unappreciated bit of history. In the early nineteenth century before there were even ice trays, wealthy people had to purchase ice as a luxury from New England frozen lakes. Frederic Tudor, also known as “The Ice King”, began harvesting ice in 1806. He then popularized ice in the tropics and eventually all over the nation. He advertised ice as a way to keep not only food and medicines cold, but also beverages. This was the start of America’s love of ice, and over time, technology improved until the modern freezer came about, and with it the possibility of making your own ice (not to mention ice-cream). 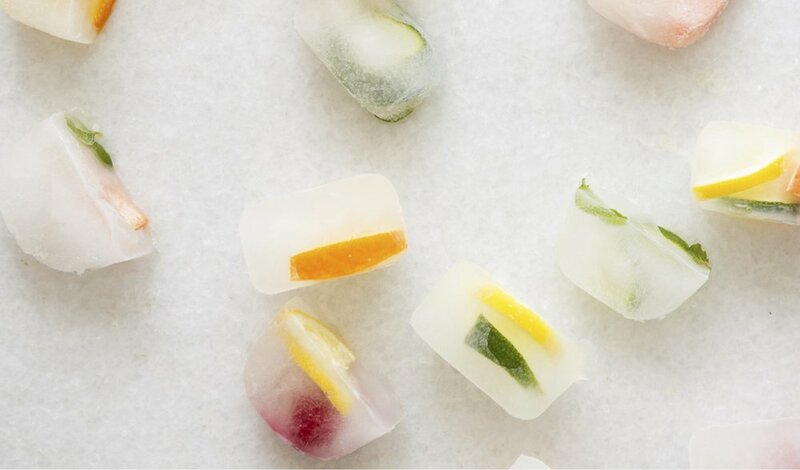 With this history in mind, change up the flavor and add a pop of color to your next chilly beverage with these fruity essential oil ice cubes. From the below list of ingredients, select the fruits and essential oils that appeal to you most. Think of which beverage you will be using these ice cubes in, and it will help direct the flavors you choose. Cut your chosen fruit into small pieces, and place pieces into a metal or silicon ice cube tray. Add 1–2 drops of essential oils per ice cube slot. Add water and place into freezer. Once frozen, add to beverage for a fun flavor combination. As always, it is never safe to ingest essential oils that are not pure, therapeutic grade oils. I use and love dōTERRA oils (and a big thanks to them for this post!). If you don't have exceptional essential oils, please reach out via the contact tab of my website. I am a Wellness Advocate for dōTERRA would love to hook you up! This post may contain affiliate links that don't cost you anything extra, but do help me! I always appreciate when people use my links!